Western blot analysis of FAS expression in rat liver extract (lane 1), rat spleen extract (lane 2), rat brain extract (lane 3) and rat cardiac muscle extract (lane 4). FAS at 50KD was detected using rabbit anti- FAS Antigen Affinity purified polyclonal antibody (Catalog # PA1119) at 0.5 μg/mL. The blot was developed using chemiluminescence (ECL) method (Catalog # EK1002). 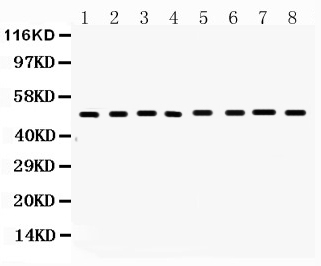 Western blot analysis of FAS expression in mouse liver extract (lane 1), mouse spleen extract (lane 2), mouse brain extract (lane 3) mouse kidney extract (lane 4), mouse thymus extract (lane 5), mouse lung extract (lane 6), HEPA1-6 whole cell lysates (lane 7) and NIH3T3 whole cell lysates (lane 8). 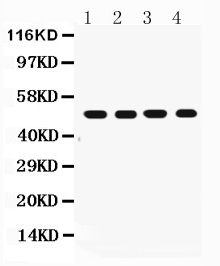 FAS at 50KD was detected using rabbit anti- FAS Antigen Affinity purified polyclonal antibody (Catalog # PA1119) at 0.5 μg/mL. The blot was developed using chemiluminescence (ECL) method (Catalog # EK1002). 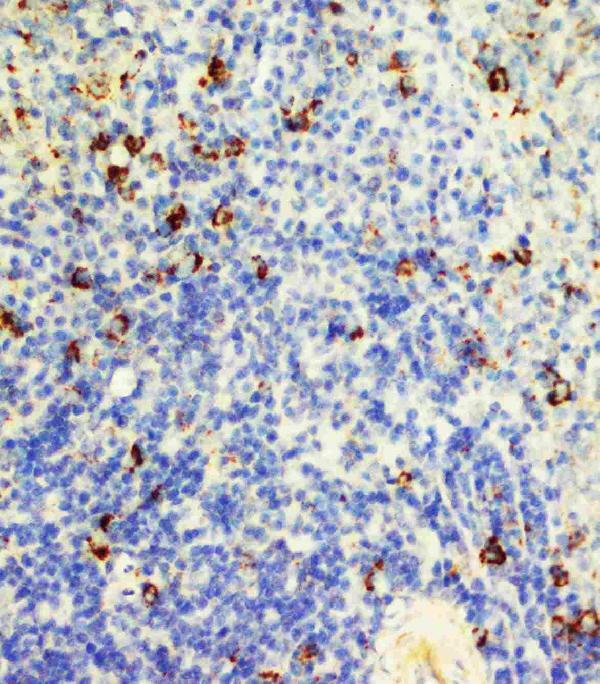 Rabbit IgG polyclonal antibody for Tumor necrosis factor receptor superfamily member 6(FAS) detection. Tested with WB, IHC-P, IHC-F in Mouse;Rat. A synthetic peptide corresponding to a sequence at the N-terminus of rat Fas (87-109aa, YTDRKHYSDKCRRCAFCDEGHGL). Boster recommends Enhanced Chemiluminescent Kit with anti-Rabbit IgG (EK1002) for Western blot, and HRP Conjugated anti-Rabbit IgG Super Vision Assay Kit (SV0002-1) for IHC(P) and IHC(F). Receptor for TNFSF6/FASLG. The adapter molecule FADD recruits caspase-8 to the activated receptor. The resulting death- inducing signaling complex (DISC) performs caspase-8 proteolytic activation which initiates the subsequent cascade of caspases (aspartate-specific cysteine proteases) mediating apoptosis. FAS- mediated apoptosis may have a role in the induction of peripheral tolerance, in the antigen-stimulated suicide of mature T-cells, or both (By similarity). .
FAS(also known as surface antigen APO1 or CD95) is a member of the tumour-necrosis receptor factor family of death receptors, can induce apoptosis or, conversely, can deliver growth stimulatory signals. It acts as an inducer of both neurite growth in vitro and accelerated recovery after nerve injury in vivo. Fas antigen is expressed and functional on papillary thyroid cancer cells and this may have potential therapeutic significance. The FAS antigen shows structural homology with a number of cell surface receptors, including tumor necrosis factor(TNF) receptors and the low-affinity nerve growth factor receptor(NGFR) and is mapped to 10q24.1. And the FAS and FASL system plays a key role in regulating apoptotic cell death and corruption of this signalling pathway has been shown to participate in immune escape and tumorigenesis. Liu Wl, Liu Zw, Li Ts, Wang C, Zhao B. Chin Med J (Engl). 2013 Feb;126(3):494-9. Hydrogen Sulfide Donor Regulates Alveolar Epithelial Cell Apoptosis In Rats With Acute Lung Injury. Ma H, Zhang X, Zhang X, Yang D, Meng L, Zhang Y, Zhou S. Arch Med Sci. 2013 Apr 20;9(2):354-60. Doi: 10.5114/Aoms.2012.31439. Epub 2012 Oct 30. The Effect Of Esculentoside A On Lupus Nephritis-Prone Bxsb Mice. Kan S, Zhou H, Jin C, Yang H. Int J Clin Exp Med. 2015 Mar 15;8(3):3258-70. Ecollection 2015. Effects Of Pdtc On Nf-? ?b Expression And Apoptosis In Rats With Severe Acute Pancreatitis-Associated Lung Injury. Li B, Chu X, Gao M, Li W. Acta Biochim Biophys Sin (Shanghai). 2010 Jan;42(1):80-9. Apoptotic Mechanism Of Mcf-7 Breast Cells In Vivo And In Vitro Induced By Photodynamic Therapy With C-Phycocyanin. Jiang H, Li J, Zhou T, Wang C, Zhang H, Wang H. Int J Mol Med. 2014 May;33(5):1298-304. Doi: 10.3892/Ijmm.2014.1684. Epub 2014 Mar 6. Colistin-Induced Apoptosis In Pc12 Cells: Involvement Of The Mitochondrial Apoptotic And Death Receptor Pathways. Li B, Xu Yj, Chu Xm, Gao Mh, Wang Xh, Nie Sm, Yang F, Lv Cy. Immunol Lett. 2013 Nov-Dec;156(1-2):68-81. Doi: 10.1016/J.Imlet.2013.09.025. Epub 2013 Sep 29. Molecular Mechanism Of Inhibitory Effects Of Cd59 Gene On Atherosclerosis In Apoe (-/-) Mice. Wu Yh, Hu Sq, Liu J, Cao Hc, Xu W, Li Yj, Li Lj. Int J Mol Med. 2014 Jun;33(6):1498-506. Doi: 10.3892/Ijmm.2014.1730. Epub 2014 Apr 7. Nature And Mechanisms Of Hepatocyte Apoptosis Induced By D-Galactosamine/Lipopolysaccharide Challenge In Mice.